This is Framed Eminem candy mosaic print. I make mosaics. I've made mosaics for Final Score Products using poker chips, golf balls, photos, political buttons,coins,skittles and playing cards to name a few. I have designed and sold mosaics for over 10 years to celebrities, athletes and museums. I've made mosaics for covers of well known magazines, music albums and company logos. My work has been featured on the Fox TV show "GLEE" as well as many news articles by outlets such as Coast To Coast AM, TMZ, The Rod Serling Foundation, Grand Illusions, Cover Magazine, Thrillist magazine and more. You won't see anything like this ANYWHERE. From a distance this looks like a colorful picture but look closer. 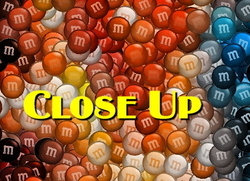 Its actually made of multi-colored M&M Candies (see "close up" image). This is for the true collector. This listing is for a limited edition print directly from the artist. This DOES NOT contain actual candy, it is an exclusive and on the highest quality non-fade professional photo paper. This is 9 inches by 11 inches and framed, ready for display. I have created this myself. It will NEVER be mass produced. VERY limited edition!! No more than 25 will EVER be released directly by the artist! You will receive a framed print along with a numbered C.O.A. that has been hand-signed by the artist.